For almost a year I have gone past the Novotel Hotel on Northbourne Ave, without knowing that there was a restaurant upstairs. Recently I have discovered that on the first level of the hotel is the recently renovated 'First Edition' restaurant and bar. The space has been transformed into a masculine and luxurious space which draws its inspiration from the reading rooms of times gone by. 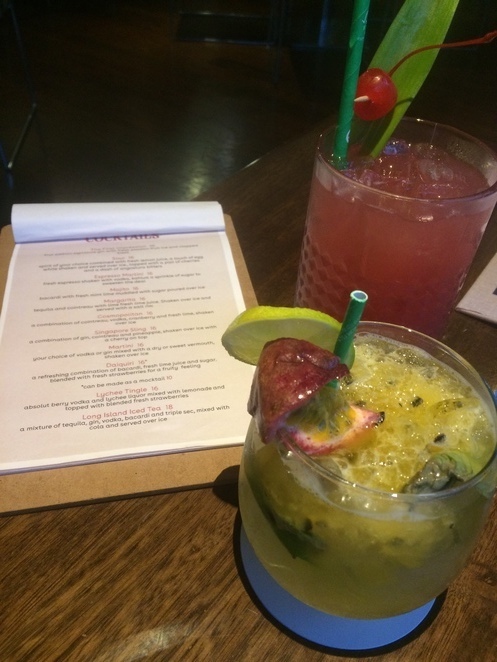 After taking in the beautiful interior, we turned our attention to the food and drinks menu. After deliberating, we decided to start the evening with some cocktails, and I ordered the First Edition Cocktail which is made with first edition signature gin and mixed with fresh passion fruit ice and clapped basil. It was lovely and tasted like summer! While enjoying our cocktails and the beautiful view of the maple trees outside, our entree arrived. 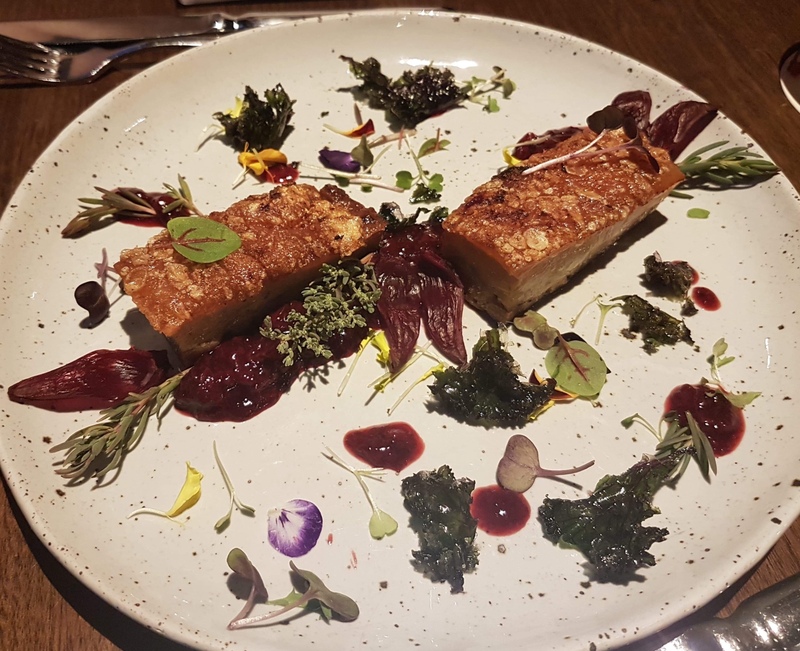 We had decided to order the Cherry Pork, and I was very happy with our decision. The pork was succulent and rich, which worked well with the native fruits, and kalette, which were both on the bitter side, and balanced out the pork. After finishing our entree, we didn't have to wait long before our mains arrived. 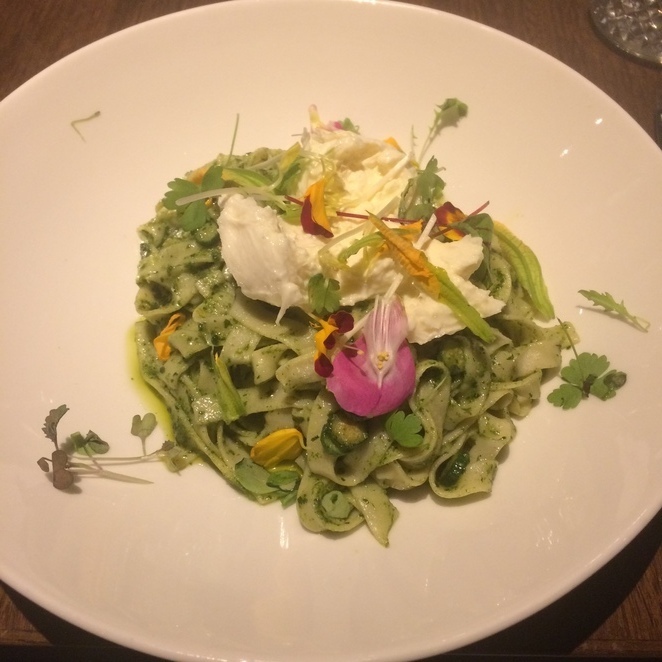 I had ordered the fettuccine with rocket pesto, flowering zucchini, and burrata. It was again a light and a summery dish that was full of flavour, yet despite it including delicious pasta, it wasn't heavy at all. 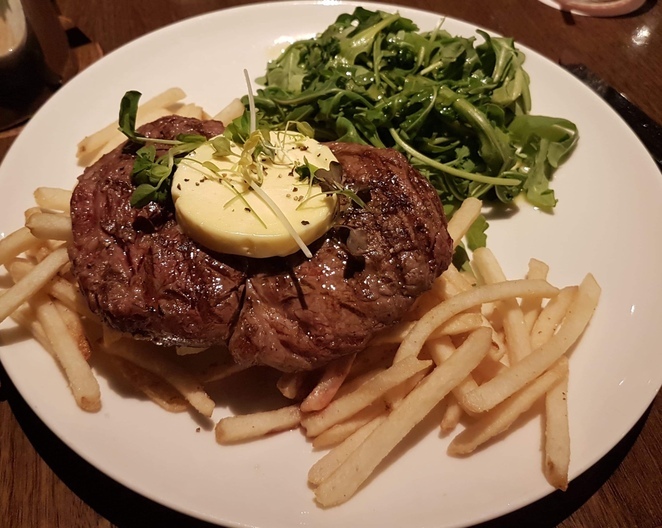 For his main, my partner had ordered the scotch fillet, and blue frog truffle butter, which is served with french fries, and a wild rocket salad. He was rather happy with his selection, and the fact his fillet had been cooked just to his liking. I, of course, tried a little and I loved how well the truffle butter went with the scotch fillet and the French fries. After we had finished our mains, we listened to the beautiful acoustic music while we pondered whether to order dessert or not. Ultimately we decided we would order dessert and ordered the 'Love is in the Air' dessert. 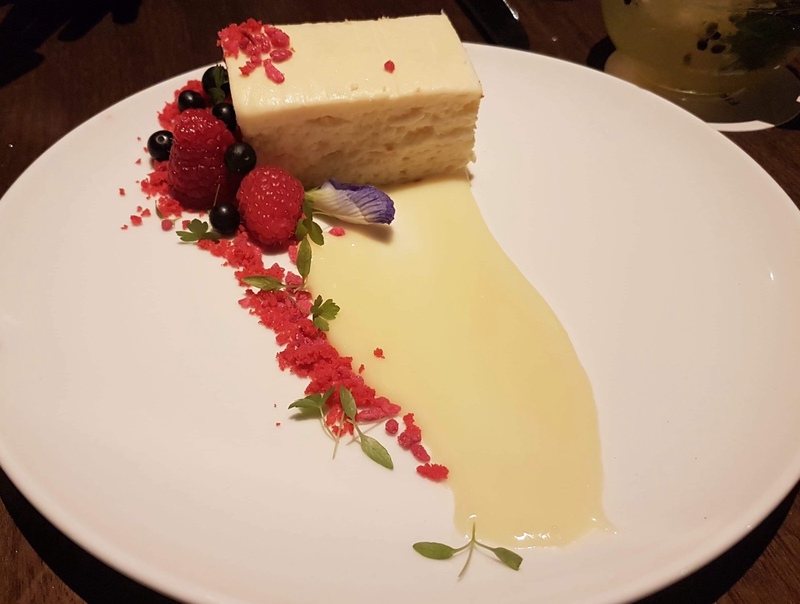 This sweet dish includes a baked rosewater cheesecake, served with crushed red velvet, white chocolate ganache, and crystallised petals. I really enjoyed the cheesecake and was surprised how prominent the rose water was. As the musician started to pack up for the evening, we also thought it was time to leave having very much enjoyed the cocktails and Locally sourced food! 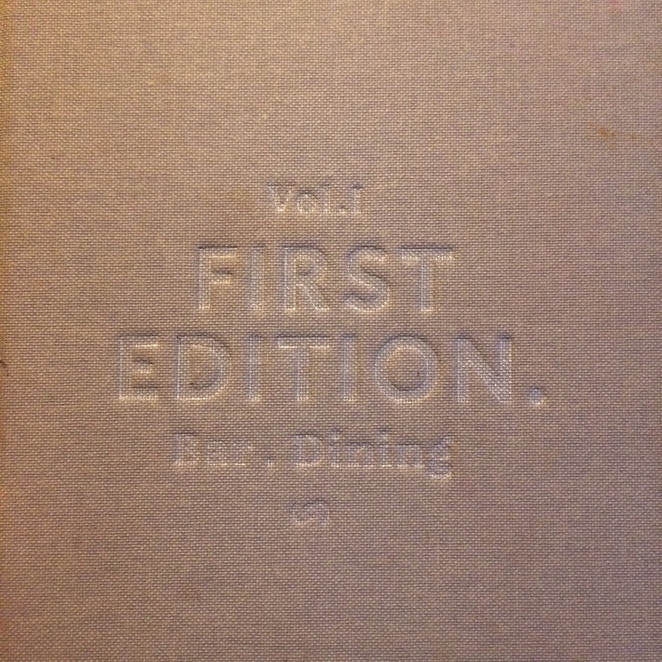 Although we both agreed that we will be returning to First Edition again, to try out their winter menu! Sounds like a wonderful place for dinner!